Plainfield, IL – The Healthcare Laundry Accreditation Council (HLAC) has re-accredited the Linen King operating plant in Springdale, AR. The plant is one of five locations for Tulsa-OK-based Linen King, which processes more than 50 million pounds of textile products annually for hospitals and medical facilities in Arkansas, Kansas, Missouri and Oklahoma. 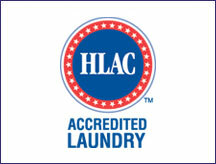 HLAC is an independent, nonprofit organization that inspects and accredits laundries that process reusable textiles for hospitals, nursing homes and other healthcare facilities – based on the highest, professionally recognized standards for patient safety and infection prevention. An independent contractor – trained on HLAC standards – conducts inspections for accreditation. The Linen King/Springdale inspection included a rigorous review of its complete textile processing cycle: from handling and transporting soiled healthcare textiles, to in-plant processing and delivery back to the customer – more than 600 standards have to be met to receive HLAC accreditation. HLAC Accreditation Standards have been developed based on federal regulations and guidelines as well as best industry practices. The standards are established as the minimum acceptable practice for the preparation of hygienically clean, reusable healthcare textiles for patient care, implemented and executed by accredited laundry facilities processing reusable healthcare textiles. HLAC’s standards are nationally recognized. The Association for the Healthcare Environment (AHE) has awarded its AHE Seal of Review and Recognition™ to the HLAC Accreditation Standards document.